The Murphy focus initially caught my attention. I had no idea who Dr. Purple was but his amusing name, reminiscent of a knock-off soft drink, also intrigued me. This sammelband, assembled by Purple and bound to his order, contains three items: The first is an autograph letter dated May 16, 1871 from Murphy to Purple, a copy of Murphy’s privately printed A Catalogue of an American Library, Chronologically Arranged (ca. 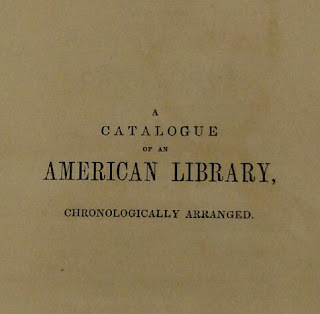 1850), and a description of Murphy’s library removed from a copy of Dr. James Wynne’s Private Libraries of New York (1860). Two portraits of Murphy of are included for visual appeal. A Catalogue of an American Library is what first fired my dopamine receptors. 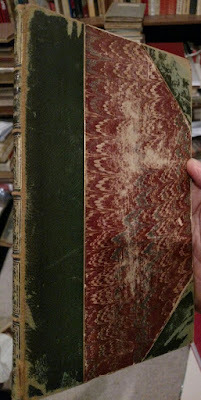 It is muy raro printed in an edition of only twenty-five copies according to bibliographer Wilberforce Eames although no limitation is found within the catalogue itself. Murphy, then about age forty, had it printed for private use and distributed copies to friends. I’m fortunate to own another example, inscribed to fellow collector, J. Carson Brevoort. It is the only other copy I’ve seen in the wilds. 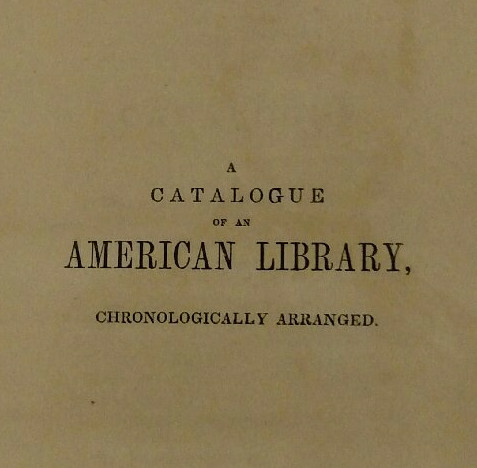 The catalogue records 589 items of Americana in Murphy’s library, many rare and important. The catalogue concludes with the statement, “End of First Part” but a second part never appeared. After Murphy’s death, his famous collection was sold in 1884 at auction in New York, the catalogue prepared by John Russell Bartlett. It is a final record of a library dispersed to the winds, many of the books now scattered among prominent rare book libraries and others still sailing about in private collections. Dr. Samuel Purple and his collections passed into unjust obscurity after his death, although he was well known to his contemporary collectors and book dealers. Purple is mentioned in Wynne’s Private Libraries of New York (1860), “Dr. Purple’s collection, which contains about five thousand volumes, is chiefly remarkable for its complete series of medical periodical literature, from its commencement in America to the present time.” Dr. Samuel D. Gross in History of American Medical Literature (1875) exchanged correspondence with Dr. Purple and records, “The library of Dr. Purple, of New York, consisting of 6,000 volumes, contains a complete file of American journals, and the transactions of the American Societies, with an extensive collection of English, Scotch, and Irish periodicals, and many choice editions of the Greek and Latin fathers.” These brief references are fortunately supplemented with a lengthy memorial tribute by his friend Dr. Stephen Smith, published in 1903 in The Medical Library and Historical Journal. Purple’s exertions did not go unnoticed. 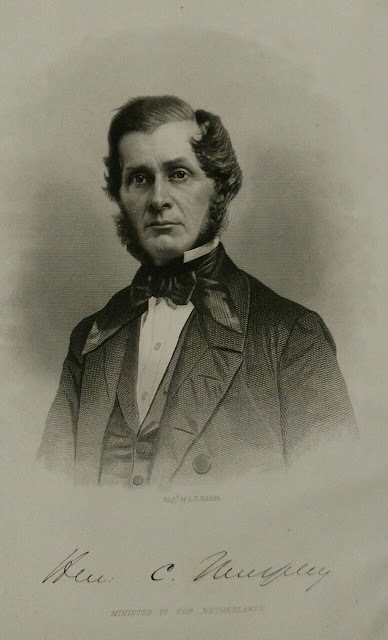 He garnered a number of scholarships that allowed him to attend medical school and he graduated from the New York City University Medical College in 1844. At first, he planned to set up a rural practice near his family home. However, upon the advice and encouragement of medical school friends he decided to return to New York City. For five years he labored under extremely impecunious circumstances to establish his practice. His memorialist Smith notes that many a young doctor under similar conditions gave up and returned to the safe confines of a less strenuous but not as fulfilling practice in the hinterlands. Dr. Purple persevered and became successful. During these early years, his literary bent led him to a position of assistant editor and then editor in 1848 of the New York Journal of Medicine. This fortuitous appointment played a key role in giving birth to the budding bibliophile. Smith writes, “[Purple’s] connection with the Journal had brought him into familiar relations with many of the leading physicians of the city. The one who exerted the greatest influence upon him was Professor John B. Beck, of the College of Physicians and Surgeons. Dr. Beck was a very scholarly man and had a large and valuable library, which he had been many years perfecting, especially in the department of rare medical pamphlets. Commenting upon the importance of collecting and preserving the early medical literature of the country, much of which was originally printed in pamphlet form, he concluded by urging the young editor to avail himself of the opportunity which his position afforded him of securing and preserving every early publication obtainable. At the same time he gave him a large number of pamphlets, which really formed the nucleus of the enormous collection which he subsequently made. These suggestions of Professor Beck stimulated into the greatest activity the latent passion for bibliography, which was finally to absorb so much of the time and means of his young friend. “From this time onward his business satisfactorily increased, both in quantity and quality, and though he never attained to a large and lucrative practice, his income satisfied every ambition except the single one of providing all the means he craved for the purchase of books. But when the opportunity offered of securing rare works he did not let it pass on account of a momentary want of money. His credit was good with all classes of book dealers and with most of the purveyors of old books he had standing orders for the purchase of rare editions. For the period of half a century he maintained a close personal acquaintance with all dealers in old books, and no quaint volume in the second-hand book stores or in the auction rooms escaped his careful scrutiny. At first his attention was especially directed to rare medical books and pamphlets, but constant association with the dealers in old books drew his attention to other inviting fields of bibliographical research. He was thus led to the study of American historical literature, and his collection of rare books and pamphlets relating to the early history of New York was very valuable. It very naturally happened that these investigations into the history of the early families drew his attention to the important and enticing department of genealogical research. To these subjects he finally devoted a large amount of his leisure time, and his collection of books and pamphlets relating thereto was probably not surpassed by any private library in this country. . . .
“The most important event in the professional life of Dr. Purple was his election to the presidency of the New York Academy of Medicine. This event occurred on the election of officers for the year 1875. . . It was an honor which he greatly prized and which he richly deserved. He had labored diligently to advance the best interests of the Academy from the outset and had contributed freely his time, his influence and whatever his slender means would permit to secure for it a library and permanent home. . . He was honored with the election to the presidency of the Academy a second time, and on January 18, 1877, delivered his inaugural address. He chose for his subject ‘Medical Libraries’. . . He concluded his address with the following appeal: ‘Will any fellow of this Academy from this time forward despise the day of small things, or consign to collectors the rags or paper stock the pamphlets or old editions of medical works which he may weed from library or garret? Will not all bear in constant remembrance that here, in this our own medical home, will be gratefully received and carefully treasured every tract, pamphlet, book, manuscript, engraving, portrait, small and great, which may be donated? “During Dr. Purple’s presidency of four years the Academy made rapid progress, both in creating the great reference library that he so strenuously urged in his inaugural, and equally in securing a permanent home of its own. His contributions to both objects were of vital importance. To the library he gave that priceless treasure the serial medical literature of this country. What that collection cost him in time, money and patient toil no one can have the remotest conception. For more than a quarter of a century he ransacked every collection of old pamphlets accessible to him in this and other cities. Many were the occasions when he despaired of completing sets, but by correspondence with dealers in old books, with the older physicians and by advertising in medical periodicals, offering at the same time suitable payment, he succeeded in completing full sets of all the medical periodicals ever published in this country. From the first his ultimate purpose seemed to be, though not expressed in words, to have the collection form part of the projected reference library of the Academy. This purpose was carried out in part when he donated upwards of 5,000 volumes of American medical journals to the library of the Academy. . . . The utilizing of thermal springs for health reasons has a long history. (One of the books lent by Purple may have been John Bell’s Mineral and Thermal Springs of the United States and Canada .) The circumstances of the letter are unknown, but a little imaginative conjecture places these two ardent bibliophiles in Joseph Sabin’s bookshop, Murphy perhaps bending deep to examine those bottom shelves, Purple a few steps over straining skyward to reach a tome on the top shelf, Sabin in the background, knowing it is going to be a good day. Murphy suddenly lets out a groan as he tweaks his touchy back wrestling with a large folio. Purple feels a twinge in his shoulder on an overreach. The two men take a breather together, discussing with Sabin the issue points on various Americana rarities and eventually the aches and pains of a certain age. Purple is a bit awed by the mildly older Murphy, this former mayor of Brooklyn, Congressman, and generally famous collector. He offers to supply a couple of books that might just help Murphy rejuvenate what ails him. 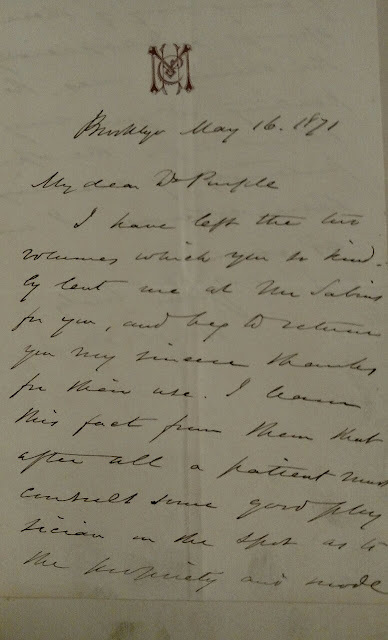 The thank you note becomes a memento, along with the rare catalogue and the dissected extract on Murphy from Wynne’s book, all bound so finely together, nestled amidst Purple’s other prizes as a token of biblio-friendship until Purple is no more. But the book itself continues on, alternatively prized, forgotten, and now resurrected, the sinuous connections of bibliophiles remaining unbroken. And I thought that I knew at least something about all the important collectors. "His income satisfied every ambition except the single one of providing all the means he craved for the purchase of books." Good stuff. Thanks, Kurt. Looking forward to the hardcover version. An illuminating job as always, Kurt. Thornton (Medical Books, Libraries and Collectors, 3rd ed.) gives the barest mention of Purple, and your work proves that volume's editors should have given him a closer look. As for Murphy's private "Catalogue," like you, I'd be inclined to believe any edition statement that came from Wilberforce Eames's mouth, but maybe we shouldn't. WorldCat appears to record upward of 50 copies, exclusive of microforms and digitals. Whatever the print run, it's still an intriguing, elusive piece of biblio-Americana. Hi Bill, thanks for interest as always. I'd never done a census so I looked closely at every WorldCat entry and Copac. Wilberforce Eames' honor must be defended! Most copies recorded are microfilm / electronic from the LC copy and not actual books. Here is a preliminary census. Only a dozen or so copies are recorded including my two examples, so Eames' total of 25 is safe for now. If anyone else finds others let me know! Well, Kurt, I hedged my bets a tad when I said "maybe" and found out the hard way one must examine every e-catalogue at the source, and not rely on what grows out of a single WorldCat entry! But I'm not wailing too hard, because I'd hate to prove W.E. wrong, and am glad it's me and not him. Once again...a stellar job on your end, and a cautionary tale for me!